As a young boy growing up in Beaufort, South Carolina, Ben Roche did the kinds of things boys that age do – make “volcanoes” and create Alka Seltzer “bombs” in his best friend’s kitchen. But for Roche, those early scientific experiments were more than a passing childhood fascination; rather they laid the foundation for a career as one of this country’s most innovative pastry chefs. As Executive Pastry Chef for Moto, Roche’s kitchen has the usual ingredients one might expect to find, but also houses tanks of liquid nitrogen, helium and nitrogen gas, items more frequently seen in a lab than in a kitchen. Worlds away from Moto, Roche’s first kitchen experience was as a dishwasher in high school. While at work, he could often be found watching the chemical reactions taking place in the baking process and Roche realized he was hooked. After graduation, he enrolled in the Baking & Pastry program at Johnson & Wales University (Rhode Island, 2000) and worked nights at Pastiche, an upscale dessert bar and café in Providence. After 18 months, he left to fulfill his school externship in Hook, England at Tylney Hall, a boutique hotel just outside London. 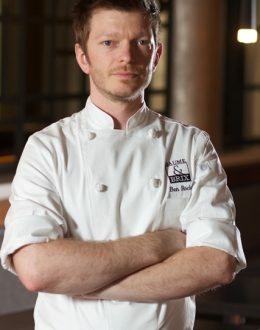 Roche returned to the States in 2002 to join the culinary team at Ouisie’s Table, one of Houston’s most esteemed restaurants. Six months later, Roche was offered a position as baker at the world-renowned Charlie Trotter’s, where he elevated his skills and was exposed to the highest level of cooking and artistry – and also where he met Homaru Cantu. The two science-minded chefs connected immediately, and when Cantu had a pastry position open up at his recently opened Moto, his first call was to Roche. After just four months, Roche was elevated to the Executive Pastry Chef position. Now side-by-side in the kitchen at Moto, Roche and Cantu inspire, collaborate and support one another to bring their forward-thinking ideas to fruition. Known to use a class IV laser, cutting edge technologies, and liquid nitrogen to create intensely aromatic food and drinks and thought-provoking dish concepts, Roche’s only concern is having too many ideas to present at one time. “Working in the kitchen at Moto is all about a new way of thinking. Our flavor combinations might seem familiar at first but many of the traditional principles of a dish are stripped away, leaving the diner to experience delicious mental stimulation and surprise,” states Roche. New dessert experiences like No Smoking in Chicago and Chili Cheese Nachos are good examples of his culinary philosophy brought to the plate. The sought after pastry chef, has shared the stage with many distinguished innovators and food specialists and his talent as a pastry chef has caught the attention of consumers and critics around the world. He has appeared on Dinner Rush and Dinner Impossible, both on The Food Network, as well as on Iron Chef America and Roche has presented at the global gastronomic forum Madrid Fusion, Stanford University’s Design School, Poptech!, Taste3 and many other events. It’s fitting that the young, curious boy experimenting in his friend’s kitchen now creates some of the most technically innovative and “explosive” desserts — as he has found in Moto a kitchen where his love of science and the culinary arts is in perfect harmony.